This is what you get when you take the Moto Z Force, swap out the guts for mid-range parts, remove the "ShatterShield" display, and hack a few hundred bucks off the price. 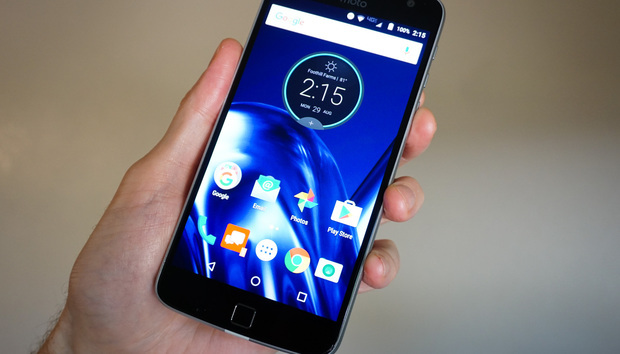 It's the Moto Z Play, a phone that looks almost identical to the Force, but hides significant differences. In fact, if you aren't overly concerned about benchmark numbers, the Play may be the better phone, despite its lower price. The Moto Z Play and Z Force look almost identical. They're almost exactly the same size, with the same flat front and back, and round camera module protruding from the chassis. Obviously, the design uniformity helps maintain compatibility with the same Moto Mods that you can use on the other Moto Z phones. The Moto Z Play even has the same tiny-but-fast-and-accurate fingerprint sensor below the display. The silver band that skirts the Z Play is smoother than the darker gray, bezeled edge of the Z Force, but you'd be forgiven for mixing up the two phones at first glance. The Z Play is comfortable to hold, fairly attractive, and just a little on the thick side with the Style Shell snapped onto the back (without that shell, the camera sticks out way too far, and you see the ugly Moto Mods connector). But Motorola had to make a few cuts to get the price down, so there are some important differences in the Moto Z Play. The Play has a bright, vibrant AMOLED display, but it's only 1080p (1920x1080), rather than the quad HD displays of the Z and Z Force (2560x1440). At 5.5 inches, you can just barely notice the difference in resolution. It stands out mostly in apps like Google Maps, which are full of fine lines and small text. It's also not shatter-proof like the Moto Z Force display. The Moto Z Play is compatible with the same Moto Mods as the Z and Z Force. The Z Play's processor, the Snapdragon 652, has been downgraded from the top-of-the-line Snapdragon 820 found in the other two Moto Z phones. It's slower, but to be honest, I didn't really notice much of a difference in most day-to-day operations. The lower-res display requires less graphics muscle, and Motorola's lean Android build, which stays close to the stock Android experience, is smooth and well-optimized. Ignoring benchmark numbers, I had to deliberately look for apps—like high-end games—that would feel sluggish. Oh, and the Moto Z Play does have one major feature you won't find on either of the other Moto Z phones: a headphone jack. I can see how the ultra-skinny Moto Z could have trouble fitting one in, but the Moto Z Force, physically almost identical to this phone, has no excuse. Is it a Moto Z Force or Moto Z Play? It's hard to tell at a glance. The camera is different than the other two Moto Z phones, too. It's a 16-megapixel shooter with f/2.0 aperture and both phase-detect and laser autofocus, but it doesn't have the optical image stabilization of its more expensive cousins. In the few pictures I snapped with it, image quality was quite nice, and the camera was quick to focus, with very little shutter lag. A deeper camera analysis will have to wait for my full review. The Moto Z Play has a 3510 mAh battery, nearly identical to that in the Moto Z Force. But the lower-res display and slower system-on-chip use less power. The result is really impressive battery life: I had lots of juice left after more than 6 hours screen-on time. With the screen calibrated to 200 cd/m2, the phone lasted over 15 hours in the PCMark battery benchmark. This is one of the best results I've ever seen. People often tell me that battery life is of primary importance when choosing a phone, but then they turn around and buy a phone with a super-fast processor and high-res display. Honestly, for most users, the greatly enhanced battery life you get with this phone is going to be more noticeable than the difference in resolution or processor speed. Like the other Moto Z phones, this one is a Verizon exclusive (for now). It will go on Sale on September 8 for $408 (or $17 a month for 24 months), That means you may or may not have the right bands available to you for GSM carriers overseas, and worse, you are saddled with Verizon's bloatware. I do not need (nor want) VZ Navigator, NFL Mobile, VZ Protect, or Verizon Cloud. These and about half a dozen other apps (including IMDb, Kindle, and Slacker) are preloaded and cannot be removed, only disabled. Oh, and Verizon's track record of bringing Android Marshmallow to previous Moto phones is absolutely abysmal. Will they do better with Android Nougat? I wouldn't risk it—even if I was already a Verizon customer, I would want to wait for Moto to eventually sell the phone unlocked and see if that one will work on Verizon. On September 15, you'll be able to preorder the unlocked version for $449.99, with availability in October.